Tag line: "Pilot Error...Or Supernatural Terror? Only One Man Can Tell!" I first learned about 1981’s The Survivor while watching Not Quite Hollywood: The Wild, Untold Story of Ozploitation, and, like many of the movies mentioned in that 2008 documentary, it definitely piqued my interest. Then, when I saw some of the names associated with this film, including co-star Jenny Agutter (Walkabout, An American Werewolf in London) and its director, David Hemming (who, as an actor, appeared in Blow Up and Dario Argento’s Deep Red), I knew it was one I had to see. But would it live up to my expectations? Shortly after take-off, an airplane carrying some 300 people crash lands in the outskirts of a small Australian village. 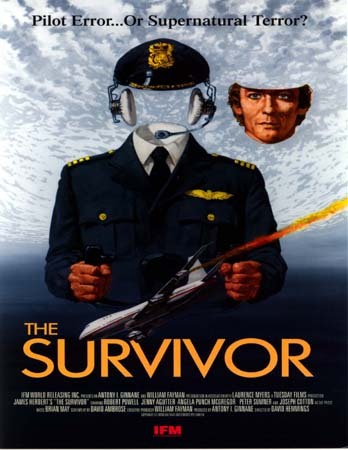 Ironically, the only survivor is the plane’s pilot, Keller (Robert Powell), who, despite remembering nothing at all about the accident, is virtually unscathed. In an effort to regain his memory and discover what caused the crash, Keller tags along with his friend and co-worker, Tewson (Peter Sumner), who’s assisting their supervisor, Slater (Robert Cotterill), in his investigation of this tragedy. For a time, Slater is convinced the accident was due to pilot error, a hunch further supported by the fact that Keller was having an affair with Beth (Angela Punch McGregor), the wife of the airline’s chairman (who was himself one of the victims on the ill-fated flight). Hoping to get to the bottom of it all, Keller teams up with Hobbs (Agutter), a psychic who, ever since the crash, has been in contact with the spirits of the deceased, many of whom are looking for the same answers as Keller himself. But these spirits are angry, and before they can rest in peace, they’re going to have their revenge on whomever it was that caused their deaths. The plane crash, which occurs in the film's first few minutes, gets The Survivor off to a dramatic start. With scenes set inside the plane (where a mysterious explosion blows a hole in the side of the aircraft); in the cockpit (Keller orders the co-pilot to jettison the fuel in the hopes it’ll make the plane lighter); and on the ground (when the plane comes down, it skids across a field, taking out trees and even a house), we experience the accident from every conceivable angle. Then, once the aircraft finally grinds to a halt, we hear the screams of its occupants, followed closely by another explosion that incinerates the entire plane. It’s obvious that a lot of work went into staging this sequence, and to the filmmaker’s credit, it looks damned impressive. From there, The Survivor enters supernatural territory, starting with a creepy scene in which Hobbs, days after the crash, hears the screams of the victims as she makes her way home (the shrieks get louder the further along she goes, and seem to be coming from every direction). From there, the spirits turn their attention towards a handful of people who tried to profit from the tragedy (a photographer, who was snapping photos moments after the crash, is first on their list), and all at once, The Survivor has become an effective ghost story. Alas, the second half of The Survivor isn’t nearly as strong as the first. The central mystery that drives the film (what happened to cause the crash?) is far too complex for its own good, with scenes that don’t make a bit of sense; to get a better look at the wreckage, Keller hops into a small plane and flies to the site, only to find that he’s instead traveled to a specific moment in the past (don’t ask how… I have no idea). Worse still is the “big reveal”, where Keller (and the rest of us) discovers who was behind it all (it’s so far-fetched that it’s almost laughable). Add a mediocre turn by Jenny Agutter, who wanders around in a daze most of the time, and a pointless appearance by Joseph Cotton as a local priest (he only has a scene or two), and you have a movie that, despite its early promise, fizzles out before the end credits roll.